Manual Soldering of reed switch leads may be required when using custom plastic housing with external cables. The reed switches need to cropped to the required length and then soldered to the cables. When soldering reed switches, some guidelines should be followed. The leads of a reed switch are composed of approximately 50% nickel and 50% iron. These leads are plated after assembly with either gold or tin to improve weldability and solderability. The coefficients of thermal expansion of the leads and glass are closely matched, but soldering heats the leads more quickly than the time it takes to seal the reed switch. The result is that this sort of sudden heating which causes metal expansion can loosen or crack the glass-to-metal seal. In most cases cables need to be soldered 2-3 mm from the seals and in such cases, the soldering tip dwell on the reed switch leads should be restricted to less than 2 seconds. If this cannot be fellowed, a heat sink between the soldering point and the glass seal, is recommended, as temperature too, has a damaging effect no these delicate devices. 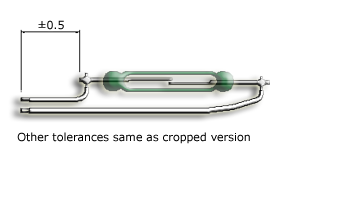 When requesting for cropped reed switches soldered to cables, kindly follow tolerances shown here.